Now that we’ve gone through why you need a blog and how to set up/import your own, we’re going to concentrate on some behind-the-scenes basics. In this tutorial we will assume that you are not planning on editing the CSS of your site and are just going to choose a pre-made theme and start blogging. 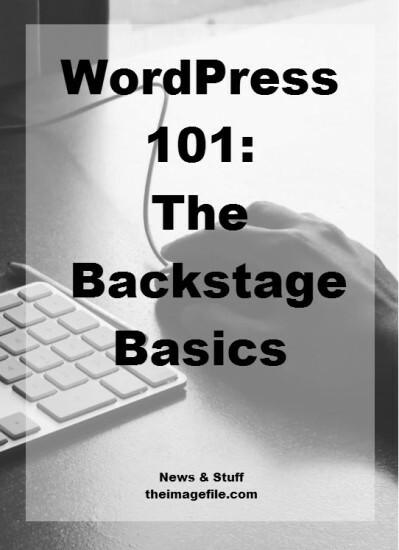 So here are some great “backstage” basics that you need to understand to make your site workable and look amazing. NOTE: When you first created a blog within theimagefile you will have noticed that your blog design had simply mirrored the appearance of your website. You can either leave this as it is or change your theme in the WordPress Settings. If you do not want to change you design then skip on to the next section of this tutorial; “Titles and Taglines”. When you first log in to your blog site it will already have some basics installed such as pages, posts, comments, menu items etc. These defaults make things easier when choosing a theme as you can see what things will look like. You will notice that some basic themes are already uploaded to your site but you most likely don’t want to choose from these. These are themes that are usually used by designers as a starting point so are incredibly basic. If you scroll to the bottom of the themes list there is a box that says “Add New Theme”. If you click that you will be brought to more WordPress themes. It’s up to you how you browse through these themes – either by what’s new or most popular or you can be thorough and work your way through from A-Z. If you want to have a bit of a trial run with a theme you can preview it live on your site. A landing page is where people “land” when they type in your URL. If you type in blog.theimagefile.com you land on our latest blog posts because this is what we have chosen to display. On WordPress you can choose to make your landing page a static page (this stays the same all the time) or a fluid page (like a list of your most recent blog posts which updates regularly). By default, WordPress displays you most recent blog posts on your landing page, like ours. If you want to set a static page as the landing page you will need to create this page in “Pages”. To choose a static page go to Settings > Reading > Front Page Displays. Your header image is the first image people will see when they land on your blog. It should be attractive, simple and relate to your business. This is a great place to put your logo or a version of it or you could use a photograph that you think describes your blog well. This section will tell you what size your image needs to be to work within your theme. You can crop your image to this size before or after you have uploaded it, it’s up to you. You can also choose whether or not to display your site Title or Tagline above your header image here. The menu is a really important part of your site because it allows your readers to navigate through your blog. On your menu you can have links to important pages within your website for example your about page and contact info as well as links to popular categories within your blog e.g. maternity, newborn, milestones and family portraits. To configure your menu go to Appearance > Menus > Edit Menus. From here you need to create a new menu and drag all the links you want to include into it. Give your menu a name and save it. Then go to “Manage Locations” and make the menu you just created your “Primary Menu”. This is will display your menu at the top of your blog site under your header image. Your site title and tagline display at the top of every page above your header (if you choose to display them) and also in the menu bar at the top of the browser. If you look at the top of this page in the grey tab you will see “WordPress 101: The Backstage Basics – News & Stuff | Photography and Business Blog | Theimagefile”. This is the “Post Title – Site Title” so keep in mind whatever you set as your site title will display here after your post title. Your tagline is similar to your title but will display on your home page in the area “Site Title – Tagline”. Pages within a blog are almost identical to pages on a website – they’re static, they don’t change. Your blog pages are designed to contain important information about you and your business that you want displayed to your customers at all times; e.g. an about page and contact information. However, the majority of you reading this blog post are going to be adding a blog to an already functioning website which already contains all of that important info, so you most likely don’t need to worry about pages. Posts are also static – they don’t change however they are more fluid than a page since there are more of them. Posts are what change every time you visit a blog site. Unlike a website where all content is likely within pages, on a blog most content is likely posts. To add a new post go to Posts > Add New or you can hover over the +New option in the black bar at the top of your blog page and select a new post from there. Widgets are a vital part of your blog that show up in your sidebar or footer. Widgets can be as simple as plain text or get complex with lists of popular posts, images, buttons etc. You can implement widgets that show information about your blog, add social networks or get people to follow you. To add widgets go to Appearance > Widgets and drag widgets into the bar on the right hand side. After you’ve completed everything in this tutorial you will have set up a blog site in its most basic form. There are tonnes of customisations and design aspects that you can continue to make but at this point you site will be up and running and will look attractive to readers! WordPress 101: Categories And Tags WordPress 101: How To Use Yoast SEO Properly WordPress 101: Top Security Tips For Your Blog 9 WordPress Tips And Tricks To Make Your Life Easier!